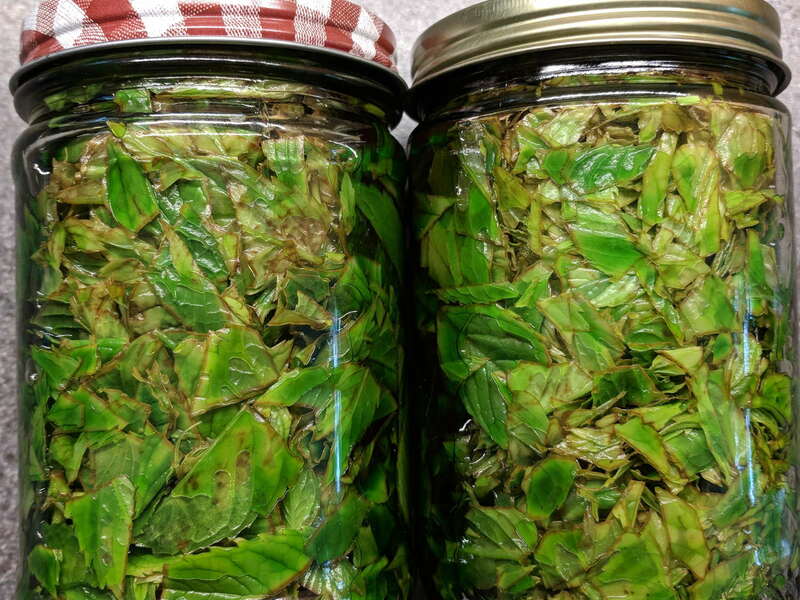 The big jars got 3 oz of coarse-chopped leaves apiece, the smaller jar 1 oz, and the (removed) stems added up to 3.5 oz, so call it 1/3 waste. 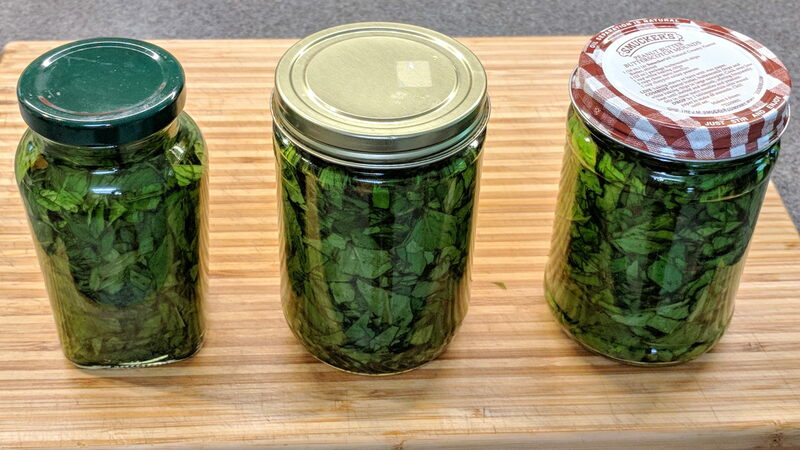 Not that this is an exact science, but I’d say 3/4 pound of just-picked mint, packed slightly tighter than those jars, would produce a liter of extract. Because we started with fresh-picked leaves, a liter of 190 proof = 95% ethanol Everclear (*) will extract the oil better than the 80 proof = 40% ethanol vodka I used for dried vanilla beans. Those bottles are lying on their sides with the camera above, looking through the air bubble to the leaves. Unlike commercial mint extract, this stuff is green! It’ll be finished after a month of daily agitation, but surely it’s an exponential process: a few hundred μl already pep up a mug o’ cocoa just fine. In very round numbers, I get 10 drops / 0.1 ml, so 1 drop = 10 μl. Bonus: the cutting board smells wonderful. (*) It may be Olde White Guy Privilege, but clerks don’t even blink when I stagger up to the counter clutching a bottle of high-octane hooch; they don’t even card my age!